Unizin's e-text initiative is working to provide more affordable course content to students. Increasingly, education is enabled by high-tech tools, data and services. And teaching and research communities benefit from global, connected environments. With the advancement of technology and the increasing wealth of digital resources, institutions are looking at more and more compelling opportunities that could serve their strategic goals for instruction and research. But they may find that many of the technologies they wish to implement are not affordable, or they are impractical to scale, or they do not interoperate with key university systems, or they are difficult to integrate. In 2014 a small group of leading research institutions — Colorado State University, Indiana University, the University of Michigan and the University of Florida — announced their founding of Unizin, a nonprofit consortium dedicated to supporting its members with a common infrastructure for education based on open standards and interoperability. The Unizin website sums up the approach well — "The Power of Collaboration: Working together to improve the learning experience with technology." Unizin offers member institutions a growing suite of relevant solutions — evolving and integrated tools, resources and services that support the basic principles of open standards and interoperability — in three broad categories: content production and collaboration; the learning environment/course delivery; and data analytics and data management. Content: The Unizin Engage e-reading platform is the cornerstone for the consortium's e-text initiative, which is focused on affordable content. One highlight of Unizin's content production toolset is Pressbooks, an open source book content management system enabling book publications that are accessible through Engage and practically any other platform. Unizin also connects its members with numerous open publishing tools that will help them create high-quality, affordable content. And, the consortium is building a collaborative content ecosystem that provides open content resources instructors can use, mix or remix in order to reduce redundant development effort and ultimately offer more affordable course content to students. Data: Member institutions may choose to take advantage of Unizin's data management solutions in the cloud, standardized on the Unizin Common Data Model. Data that retains its identity (not anonymized) from sources such as the university's own student information system, its learning management system and its data warehouse is protected and wholly owned by the university — accessible only by that institution. Institutions may further elect to allow their de-identified (anonymized) data to be used, through the Unizin Data Platform, for consortial research purposes. Learning environment: Consortium members identified Canvas by Instructure as their LMS of choice because of its record of adherence to open IMS Global standards and its use of commercially available open source software. Unizin recognizes that optimal course delivery goes beyond merely streaming or uploading digital files and is working to provide common solutions that both integrate with an LTI-compliant learning platform — such as Canvas — and apply data-driven strategies to digitally enhanced content. Unizin Engage integrates smoothly with the LMS in this environment for course content delivery and for logistical choices such as online or offline modes, while enabling content interaction data for instructor insights and learning analytics. Are you making an impact with technology in higher education? We want to know about it! 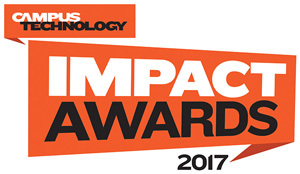 The 2018 Campus Technology Impact Awards call for entries is now open. For more information, go to campustechnology.com/impact. Now open to new member institutions, the consortium has grown to a dozen institutional or university system members. All members can provide input into the goals and direction of the organization. Currently, more than 70 individuals from member institutions serve on the Unizin Teaching and Learning Committee, making recommendations for the Unizin board's strategic priorities. The Unizin suite of solutions is designed to be extensible, in keeping with the operating principles of openness and interoperability. It is also understood that "one size does not fit all." The intention is to allow each member institution to progress with technology implementation at its own rate, selecting from the available tools and services and participating in consortial activities as it deems appropriate at any point in its progression. Qazi observed, "This is a journey — one that universities are well-suited to engage in at all levels."